Feel confident that you can give your customers what they want, even when your equipment doesn’t accommodate the project specifications. Our state-of-the-art fabrication shop can perform any cut, specialty, or standard task to get your large projects started. Create custom looks with our letter and logo fabrication capabilities, whether it’s a specialty typeface or a unique dimensional appearance that is branded just for you. Our state-of-the-art fabrication equipment can rout or laser cut intricate typefaces and detailed logos. We make your vision come to life from 2-D drawings to unique 3D letters and logos. 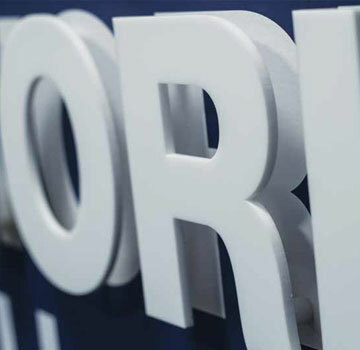 For large volume projects, Rowmark can expertly apply the right adhesive for mounting projects directly to the wall, inside a sign frame, or more. Our fabrication team is experienced in heat bending plastic materials for all applications including table tents, pocket-badge foldovers, and cubicle wall signage. Our materials are popularly used in the name badge market. We have the largest selection in the industry of findings for name badges including magnetic, pin-backs, clutches, and posts. Let us apply the best finding to your project. 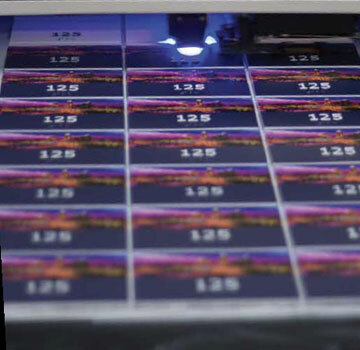 UV-LED print technology amps up print projects with the capability of adding ink to an unlimited array of light, dark, or metallic print media substrates with an impressive ability to add raised or textured elements with ink! UV-LED printing is perfect for full-color graphics, project prototyping, small volume, highly custom, or decorated projects. For projects that require a high level of vibrancy, screen printing is the perfect option. We can add bright, crisp layers of ink for your detailed logos or artwork. Screen printing is a great solution for Pantone color matches and high volume projects. When a project requires an extra touch of color, hot stamping may be the perfect choice for small volume projects. Hot stamping reproduces crisp graphics such as logos, metallic finishes, or areas requiring a high-quality image achieved by colored films for a truly professional end result. Let us handle the fuss and mess. Our team takes great care throughout every step of the fabrication process to ensure you receive clean, precise fabricated parts. After each run, the part is cleaned, inspected, and packaged to your specifications. Custom signage and personalization projects are often afterthoughts for businesses requiring quick turnaround times at a moment’s noice. Now you can easily meet your customers’ demanding timeframes with Johnson Plastics Plus’ fabrication and finishing services available to you. We specialize in providing quick turnaround times in five days or less, with flawless, professional results for you to finish, customize, and personalize.